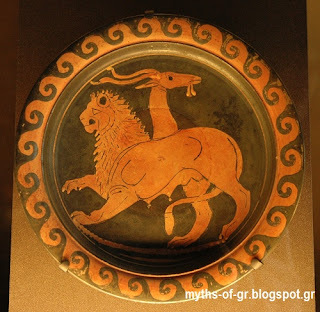 Chimera | Learn about Greek Mythology,Greek gods,Greek mythology stories! In Greek mythology Chimera refers to a terrible monster which was breathing out fire, had the body of a goat, a lion's head and tail of a snake. According to other descriptions, had more than one head, commonly three heads(head of a lion, goat and dragon). According to Hesiod Chimera was the daughter of Typhon and Echidna. Chimera was joined with Matins and their descendants were the Nemean Lion and the Sphinx. The monster allegedly bred by the king of Caria Amisodoros. Eventually was killed by Bellerophon , who was riding a flying horse, Pegasus, in Caria and had some help by goddess Athena, There are more than a description of how this killing happened. According to one, Bellerophon merely hit the monster with his spear. According to another,he used pencil, which melted by the hot breath and killed Chimera. As residence of the monster are mentioned many areas such as Phrygia, the Indies, and even Libya. More formal but allegedly ancient Corinth and Sicyon which can be seen at the coins and shields of the soldiers.